Learning Guitar for Free (for Now) on YouTube Two guitar instructors have gained YouTube followings by posting videos that teach both basic strumming techniques and the opening riffs of popular songs such as "Sweet Home Alabama." But copyright concerns could put an end to the free classes. Let's say you want to learn to play guitar — but you don't have the time or money for lessons. Why not try YouTube? A number of people teach guitar on the video-sharing Web site, offering lessons for free. In the past few months, two teachers have posted around 200 videos that demonstrate everything from basic strumming techniques to the opening riff of "Sweet Home Alabama." So far, people around the world have watched the videos a total of more than 3.5 million times. One of the teachers is David Taub, who lives in San Diego and often appears wearing a flannel shirt and a backwards baseball cap. A one-time bar band rocker from New Jersey, he opens each video with the same line: "What's up, good people!" His most popular video, a simplified version of the Eagles' "Hotel California," has been viewed more than 125,000 times. The other teacher is Justin Sandercoe, who lives in London, where he teaches guitar and plays with a famous pop singer. He's a mellow presence with an impish grin. Among his song lessons is an acoustic version of Britney Spear's "Hit Me Baby One More Time" that is surprisingly affecting. The teachers play slowly and use close-ups, showing each finger movement. If you don't get it at first, you can hit replay. It's like having a teacher with endless patience. The lessons are informal and feel home-made. Sandercoe sometimes appears sitting on his floor, with his hair matted at different angles. Taub's lessons are mostly unedited and include moments like his golden retriever eating his guitar pick. 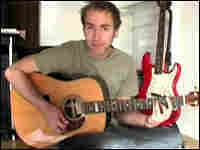 Taub sees the videos, at least in part, as a marketing tool for his paid instructional Web site, NextLevelGuitar.com. His videos emerged last year as an experiment when one of his students, Tim Gilberg, shot video of Taub teaching. "We filmed about 10 minutes in his backyard," Gilberg recalls. "I put it up on Google. Then I forgot about it. Basically, two months later I went to see how many visitors we had. There were about 6,800 visitors, and I was like: Wow!" Then they posted the videos to YouTube, and the audience took off. On the free videos, Taub teaches the basic chords to popular songs, but he holds off explaining some of the riffs so he can drive people to his site. After playing a riff from Sheryl Crow's "If It Makes You Happy," he stops playing and says, "But if you want to learn that, you're going to have to go to our full site for the lead lines, okay?" Gilberg says the Web site has hundreds of members after only six weeks. Justin Sandercoe also has a teaching Web site — justinguitar.com. He has a few ads and takes donations through Paypal to cover the site's hosting fees. But Sandercoe doesn't charge visitors; he says he sees the site as more of a public service. "I like the idea of being able to deliver quality guitar lessons to people who can't afford lessons, or who are in places where there's not that kind of access to somebody who can teach them the right stuff," he says. When Sandercoe was growing up in Tasmania, it wasn't easy for him to find great teachers. He hopes his videos will help kids in places like Sri Lanka or India who may not be able to learn otherwise. Sandercoe now has fans around the world, who often e-mail him with questions and requests for specific lessons. One is Linda Dumitru, who lives in the Netherlands and used to pay $26 for a half-hour lesson. But she stopped, she says, because she couldn't afford it. Then one day she typed "Johnny B. Goode" into YouTube and found one of Sandercoe's videos. Now, she plays along to his videos in her apartment after dinner. Dumitru says Sandercoe's laid-back approach makes her want to learn. She talks about him as if he were a helpful, next-door neighbor. "Every time he comes, he says: 'Hi, I'm Justin.' He says, 'Don't worry if you have trouble with the chords, because everybody has problems with it.'" She adds: "It's like he understands you. He knows what you're going through." When Sandercoe isn't teaching, he plays with Katie Melua, a star in Europe, so he's used to some attention. But his work on the Internet is raising his profile in ways he didn't expect. "I got recognized on a bus the other day," he says, sounding amazed. "I literally went into town to do a bit of shopping, and I was on the way back and this kid goes: 'Are you Justin, the guy who teaches from YouTube?'" But if learning pop songs for free online sounds too good to be true, it may be. John Palfrey, executive director of the Berkman Center for Internet and Society at Harvard Law School, says most of the songs Sandercoe and Taub teach are under copyright. He thinks it's only a matter of time before a licensing company orders YouTube to take them down. "There's a very strong argument that the re-use of well-known chords in the sequence the instructor played them would be a violation of the copyright," Palfrey says. Sandercoe doesn't think he's doing anything wrong. After all, he says, he rarely plays the songs all the way through. But Palfrey says all it takes is a few notes. And although Sandercoe sees his Internet teaching as a public service, he has benefited from it. Since he put his Web site up last year, he has developed a long waiting list for the lessons he teaches in person. And both he and Taub say that's still the best way to learn. If someone tells Sandercoe to take down his song lessons, he says he will. But his most valuable videos are the ones that teach guitar basics — things like strumming, scales and finger-picking. And even in the digital age, no one holds a copyright on those things.